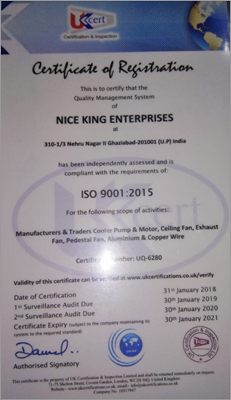 Established in 2015, we Nice King Enterprises are a manufacturer and supplier of a wide range of products that includes Exhaust Fan, Exhaust Fan Motor, Washing Machine Motor, High Speed Motor, Cooler Kit, Cooler Pump, Ceiling Fan, etc. Our company is located in Ghaziabad, Uttar Pradesh, India. We are experts in this domain and can manufacture the best quality offerings in the market. These are manufactured with extreme care and without any negligence. Apart from manufacturing quality products we are also well known for our commitment towards timely and safe delivery of offerings. Stringent quality checking methods- We ensure to undertake, stringent quality checking methods in order to ensure best quality products. We quality check every stage of manufacturing process to avoid any sort of damage or defect in the outcome offerings. Best quality packaging- We also ensure that every product, after manufacturing, is properly packed with best quality packaging materials. This helps us ensure that the offerings do not get damaged during transit. Proper Storage- Proper storing of our offerings also helps us in maintaining its quality. Our warehouse is staffed with efficient storekeepers to manage all the activities and maintain a check on the incoming and outgoing consignment. This also helps us to ensure that the products do not get damaged until these are shipped safely. An infrastructure is the most important element to run a business. It not only a well spacious building but also includes machinery and advanced technology. This helps us in manufacturing our offerings efficiently in a precise and timely manner as required by our clients. This also takes less time in the manufacturing process and thus increases the level of productivity. Apart from the hi-tech machinery and equipments our infrastructure also contains warehousing facility to store finished products. All our products are properly packed, marked and labelled and are properly stored in order to ensure safe transit of our offerings.